If there is one person in history whose activities changed the world the most, that person is Adolf Hitler. 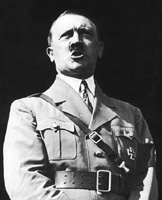 Hitler (1889-1945) was the German dictator who founded the National Socialism (Nazi) movement in 1920. Within twenty years, Hitler had led Germany and its allies into World War II (1939-1945), by any measure, the most devastating war in history, with over 60 million people killed. As a young man, Hitler served in the Bavarian army during World War I. (Bavaria is a part of Germany.) Although he was recognized for bravery, the experience embittered him, and he blamed Germany's defeat on Jews and Marxists. In time, Mein Kampf would become the bible of the Nazi party. The party grew slowly, however, until the Great Depression, during which Hitler's skills as a speaker and organizer allowed him to capitalize on the growing social and economic unrest. As a master of the "big lie", he was able to build substantial grass-roots support, based on a platform of anti-Semitism and anti-communism. Although he had some false starts, Hitler became Chancellor of Germany in 1933 and, within a year, was given full dictatorial powers by the government. In concert with other Nazi leaders  principally Goering, Himmler and Goebbels  Hitler crushed all opposition and took control of most facets of German life. In 1934, laws were passed to establish official anti-Semitism and to create the first concentration camps. 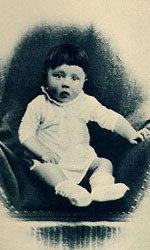 On August 2, 1934, the elderly president of Germany died. Within hours, Hitler declared himself Fuhrer (supreme ruler) of Germany. Technically, the declaration was illegal. However, less than three weeks later, a special election was held in which 90 percent of the German people voted to confirm Hitler as Fuhrer. Hitler was now the absolute ruler of Germany, a law unto himself. Over the next few years, Hitler prepared Germany for war, carrying out many political maneuvers that allowed him to extend his power into smaller, less powerful countries. On September 1, 1939, Germany invaded Poland. Two days later, Britain, France, Australia and New Zealand (the Allies) declared war on Germany, formally starting World War II. At first, Germany had a great deal of military success, invading and conquering much of Europe, North Africa and Russia. On December 11, 1941, Germany declared war on the United States, upon which the U.S. entered the war on the side of the Allies. Still, it was some time before the Germans would be stopped. Indeed, on April 26, 1942, Hitler declared, "This war no longer bears the characteristics of former inter-European conflicts. It is one of those elemental conflicts which usher in a new millennium and which shake the world once in a thousand years." In the fullness of time, Hitler was proved to be wrong. On February 2, 1943, he received his first major setback when the Germans were defeated at Stalingrad in southwest Russia. Over the next two years, the Allies began to defeat Germany, one battle at a time and, by the spring of 1945, virtually all of Europe and North Africa had been liberated. 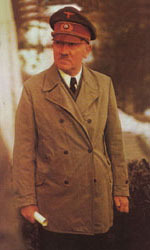 With the Third Reich collapsing around him and the Russians approaching, Hitler hid in an underground bunker in Berlin. On April 29, 1945, as the Russians approached the city, Hitler married his longtime mistress Eva Braun. The next day, both Hitler and Braun committed suicide.